I just finished reading Gabe’s Triumph by PM Smith, and all I can say is what a great book this is! What an absolutely fantastic author. According to Granny Apple Publishing, this is PM Smith’s very first book. I would say the author has a fantastic future ahead of her. About the book: Gabe’s Triumph is set in early 20thcentury rural Indiana. So we’re talking somewhat modern history here but not exactly because rural Indiana in the early 20th century was still well, very farm like. They did not have cell phones, malls, or super markets full of vegetables pre-peeled and washed. They had to hunt for their meat and grow their own produce if they wanted to eat. You couldn’t walk down to the store and buy a pair of jeans. You had to make everything yourself. I think most of us would probably not last more than a day in rural Indiana. 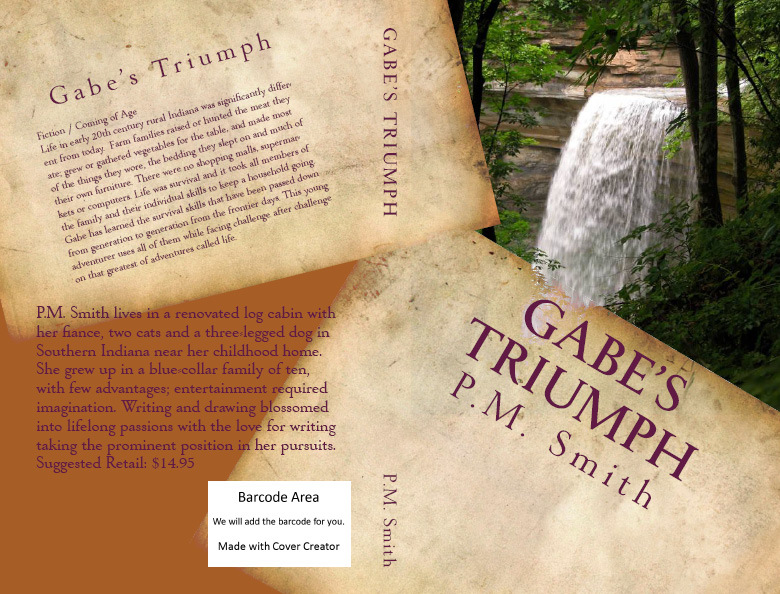 Gabe’s Triumph details a young Gabriella’s life in rural Indiana during late 1900’s to early 20th century. Her family is poor and they suffer many hardships throughout the book. They eat the meat they hunt and the vegetables they grow in their garden. They make their own furniture, wash their clothes by hand, and the girl’s grandmother is a healer. There’s a lot of action in the book. Gabriella goes on a hunt and ends up falling over a waterfall, there’s the bear attack on Ma, a fire, death, and love. You’d have to read the book yourself to really understand the depth of what Gabriella endures during her journey. Author P.M. Smith knows how to tell a story in a way that makes you not want to put the book down. Maybe I shouldn’t admit this but I neglected my kids for 3 hours while I locked myself in my bedroom and read the book front to back. My husband was home, but I still feel a bit guilty about thatJ. I haven’t had the urge to read through a book in a single setting in quite a while. Gabe’s Triumph is just fun to read, and I literally couldn’t put it down, it even went into the bathroom with me….